During a time when teenagers were doing the jitterbug and Uncle Sam was asking young men to enlist, The Andrews Sisters were America’s most popular female singing group. Patty, the youngest sister, was a loud and energetic blond who headed the group with her confident vocals. The middle sister was Maxene, a brunette, whose harmonic range gave the impression of four voices instead of three. Finally, completing the trio was the eldest, LaVerne, a strong willed red head with a witty sense of humor and an eye for fashion. The Andrews Sisters versatile sound and range in genres explains their longevity in the music industry and popularity with people all over the world. They had major hits in nearly all types of music ranging from swing to country-western. This tremendous popularity did not stop in the music business. The trio could also be found performing in radio series, commercials, Hollywood movies and on Broadway. Born in Minnesota, the three Andrews sisters developed a love for music at an early age. As children their first experience with music occurred when LaVerne had her two younger sisters sing a musical note around the family’s piano. This experience awakened the girls love for music and they began spending all of their free time singing and mimicking the successful singers of the time. Some of their first major influences included the Boswell Sisters, Ella Fitzgerald and Mel Torme. The girls got their start when Larry Rich hired them to go on tour with his 55 member troupe. In 1932 they stopped touring with Rich, but the girls continued to sing at fairs, vaudeville shows and club acts. While touring the girls worked hard on their craft and rehearsed daily, sometimes practicing in the back of their father’s Buick while driving to the next show. After six years of living on the road the girls had their first major success with “Bei Mir” which sold 350,000 copies. The song held the Billboards No. 1 slot for five weeks. This achievement established The Andrews Sisters as successful recording artists and they became celebrities. During this time the sisters were very active in their patriotic duty of wartime entertainment. They volunteered their free time to entertain enlisted and wounded men by singing, dancing and signing autographs. In June of 1945 they participated in an eight-week USO tour and performed for thousands of servicemen. They had been hoping to do such a tour since the war started in order to give back to the soldiers that were fighting. Back in the states they recorded “I Can Dream, Can’t I?” which is recognized as one of the most artistic, professional and memorable ballads ever recorded. It was No. 1 on the Billboard charts and remained in the top 10 for 20 consecutive weeks. All this success did not come without its share of hardship, however, and in the early 1950s the Andrew Sisters started to face troubled times. First, Vic Schoen, the trio’s band leader and composer left the group. This was a huge blow because he and his orchestra had accompanied the girls in over 90 percent of their recordings. Aside from his constant presence he was also very skilled in arranging music for the trio. Patty tired of being part of a group. In 1954 she left her sisters and attempted a solo career. However, she never matched the success she had with The Andrews Sisters. In Patty’s departure Maxene and LaVerne formed their own act, and were well received by both audiences and critics. In 1956 sisters decided to reunite both professionally and personally. They began to experiment with a new sound described as a light rock-and-roll, which did not gain popularity with the public, who preferred hearing old hits. At this time the girls were up against a new wave of talent such as Elvis Presley and Chuck Berry and the sisters did not match their pervious success. In 1967 LaVerne was diagnosed with cancer. She died a year later at the age of 55 in her Brentwood estate. Maxene and Patty decided not to continue performing without LaVerne and the sisters pursued different careers. Maxene accepted a position at Tahoe Paradise College and eventually became Vice-President. Patty continued performing making guest appearances on a variety of shows including Lucille Ball’s Here’s Lucy and The Gong Show. She starred in a Los Angeles musical theater production called Victory Canteen written by Milt Larsen and Bobby Lauher, with music by Richard and Robert Sherman. 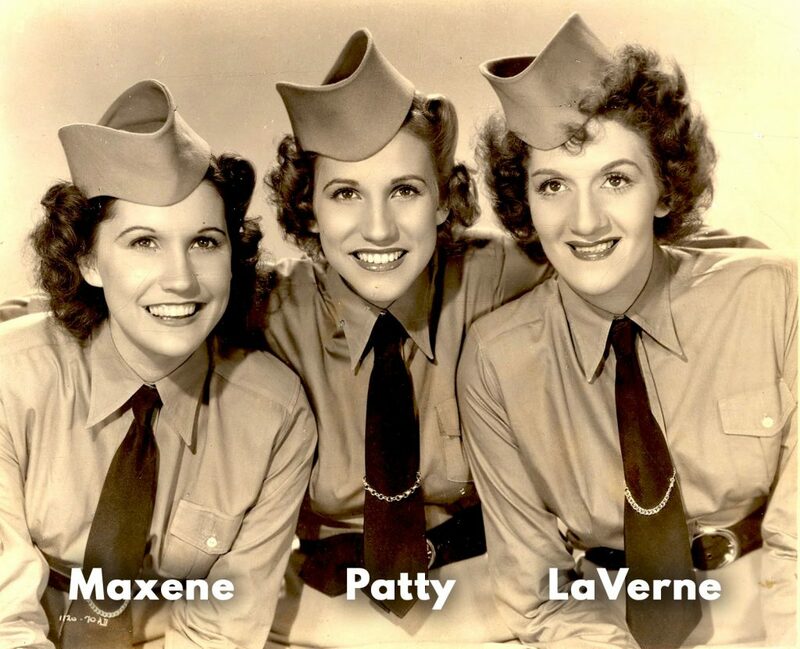 After the success of Victory Canteen the Shermans teamed up with Will Holt to write “Over Here!” a musical about the WWII homefront starring Patty and Maxene Andrews. After 341 successful performances the show closed. The two sisters continued solo careers until the 1990s. In 1995, while on vacation in Cape Cod, Maxene had a heart attack and died. She was 79. Patty Andrews died January 30, 2013 at the age of 94. The Andrews Sisters were vibrant figures in the entertainment industry for about 30 years, and they still appeal to both the young and old. Some of their accomplishments include selling over 90 million records, recording about 700 songs and earning nine gold records. Today, The Andrews Sisters are still recognized for their engaging harmony and witty sense of humor. The trio brought music, laughter and happiness in a dark period for Americans. They are lovingly remembered by their fans and still remain one of the best-selling female vocal groups of all time. As the exclusive licensing agent for The Andrews Sisters, CMG Worldwide is dedicated to maintaining and developing a positive brand image for our client. CMG is a leader and pioneer in its field, with over 37 years of experience arranging licensing agreements for hundreds of personalities and brands in various industries, including sports, entertainment, music, and more. We actively seek out commercial opportunities that are consistent with our brand positioning goals, and we are committed to pursuing strategies that meet the goals of our clients, as well as our licensing partners. Please contact us today if you are interested in licensing opportunities with The Andrews Sisters. For a full list of CMG Clients, please visit our website here.